Contemporary Zuni bracelets combine master craftsmanship with quality materials. The choice of craftsmanship includes cluster, petit-point, needle point, inlay – both channel and ‘stone-on-stone’ and the remarkable ‘snake eyes’ comprised of small rounded dots of turquoise or coral. 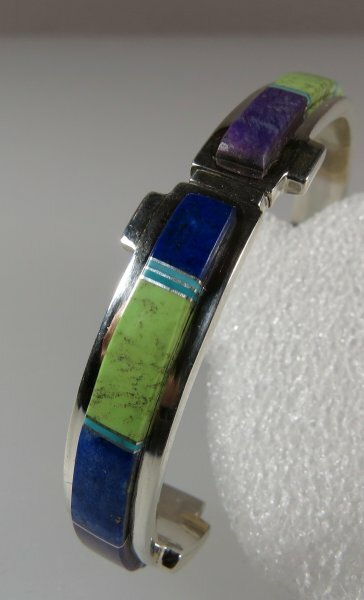 There are several types of Zuni bracelet designs. The most recognized are: cuff bracelets (usually wide but with some tapering), cluster bracelets of stones in round or oval patterns, inlay bracelets (with juxtaposed stones and shells), channel bracelets (with strips of silver between the stones and shells) and needle point/petit-point bracelets. Featuring these and other Zuni jewelers: Anson and Letitia Wallace, Sheldon Lalio, Josie Oweleon, Lorraine Waatsa, Edrid and Connie Seoutewa, and Octavius and Irma Seoutewa.